The SPE Range of captive shot blasting machines specifically designed for the dust free shot blasting of vertical steel surfaces up to SA3 standard. The Vertical Blast Machine Series has been developed mainly for the preparation of vertical steel surfaces. The design of the blast head provides recovery of abrasive by kinetic energy and vacuum providing major benefits over conventional methods. The SPE V3 series is designed to blast clean internal and external storage tank walls. The unit is suspended by a rigging system or crane and can be operated by one person using a remote control on ground level. A high powered magnetic roller clamp arrangement holds the V3 to the steel surface eliminating abrasive loss and dust emission. 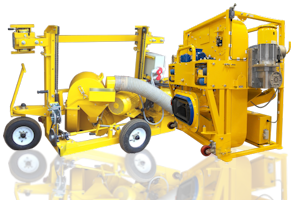 The V3 offers a highly productive and environmentally safe alternative to conventional open blasting methods.